There is always something happening at Charter Primary School, whether it’s enjoying one of our Family learning events, learning new languages or supporting our many sports clubs. We have tried to convey some of that sense of both wonder and celebration through this site and allow you to see why our school means so much to us all. The main aim of the school is to help our children to fulfill their potential in all areas of development and to grow into happy, effective, caring adults irrespective of background, ability or gender. We aim to offer a full and interesting curriculum encompassing knowledge, skills and understanding that will help prepare our children for future education and give them the skills and the enthusiasm to pursue learning for the rest of their lives. We firmly believe in a genuine partnership between home and school. We all want the best for our children and it is only when this partnership is thriving that children flourish in our care. We always welcome parents into school, you are as important to us as your children – it is our school for the benefit of our children, and we hope that your association with the school is a long and happy one. We warmly invite prospective parents to visit our school. 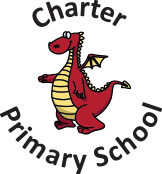 If you would like to come and look around and catch a glimpse of what we get up to at Charter Primary School, please telephone the school office to make an appointment.